If you’ve been a fan of the Dodge Ram 3500 for years, then prepare for one of the best yet. Here at Ewald CJDR, we are more than happy to unveil the brand new 2019 Ram 3500 HD. Offering more power, efficiency, and features than previous models, these vehicles will make a fine addition to your job site. From hauling your motorhome to trekking through rough terrain, these rugged vehicles are some of the best in a long line of Ram diesel trucks. Aside from maintaining their robustness, these Ram trucks for sale have an all-new level of refinement to them never before seen in the Ram 3500. With an array of safety and entertainment features loaded in these new diesel trucks for sale, now is an excellent time to come check them out. Below are some of the features and improvements that will be offered in the all-new Ram 3500 HD. Some of the excellent technology truly sets the Dodge Ram 3500 HD apart from others in its class. For example, the available 360° Surround View Camera with Trailer Reverse Guidance View uses five cameras to provide a complete picture of the truck’s surroundings. This helps to take away the hassle of trying to hitch your truck to your trailer, allowing you to do so with the greatest of ease. All of this will be displayed on a large 12-inch touchscreen infotainment system, which is also connected to an immense 750-watt multi-channel amplifier. This sound system is fed into a surround sound system of 17 speakers all around you, letting you get as loud in these new Ram diesel trucks for sale as you wish. However, those looking to have a more quiet ride will be sure to enjoy the Active Noise Cancellation technology. Aside from ANC, these new Ram trucks for sale employ electronically controlled frame-mounted active-tuned mass modules, providing a tranquil and vibration-free ride. Aside from convenience and entertainment features, there’s a lot more offered in the new Ram 3500 HD when it comes to technology. These trucks for sale near you feature Forward Collision Warning With Active Braking. This helps to alert you if the system detects if you happen to be distracted and about to make an impact. If it detects that you’re unable to react quick enough, this intelligent system will automatically apply the brakes for you. Similar technology was also used to provide the convenient and smart Adaptive Cruise Control with Stop technology offered in the Dodge Ram 3500. Not only will this advanced cruise control be able to adjust and keep a safe distance from cars ahead, but it will also apply the breaks if it detects stopped traffic ahead. If you’ve had trouble parking large Ram diesel trucks in the past, then you’ll also be sure to love the front and rear parking assist offered in there new pickups. In addition, no country roads will be too dark due to the Adaptive Forward Lighting System. Allowing the headlamps to rotate up to 15° means that these bright LED lights will follow wherever you turn. Although the Dodge Ram 3500 has been considered a workhorse in the past, they almost pale in comparison to the latest model. These new Ram trucks have ranked best-in-class where it truly matters: Power. With a best-in-class 35,100 pounds of towing capability in these diesel trucks for sale, hauling even the largest trailers can be a breeze. 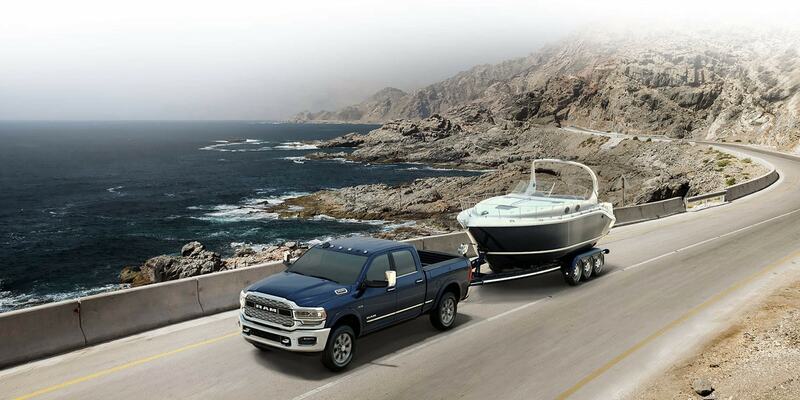 The large towing capacity of the Ram 3500 HD is in part thanks to the 6.7-liter High Output Cummins Turbo Diesel engine. This Herculean engine is able to churn out an impressive 1,000 lbs-ft of torque, more than any others that have come before it. However, the performance of these Ram trucks for sale near you isn’t just limited to their sheer power. A class-exclusive auto-level rear suspension automatically adapts to shifting loads, changes in road camber and for a parallel hitch between truck and trailer. Another contributing factor to the towing capabilities and handling of these Ram diesel trucks is the all-new frame. Although this frame is mostly made from high-strength steel, Ram has also added aluminum to take away some of the unneeded weight. The aluminum may only remove 40 pounds from the frame, but you’ll definitely be able to feel an improvement in response.